Relocation affects not just employees but the whole family. Find out about the importance of family support in making a positive difference to both domestic and international relocation outcomes. The offer of a transfer to another part of the country or abroad turns a family’s world upside down. If the aim of the organisational relocation exercise is to move the employee long term or permanently to the new location, the possibility of the employee’s undertaking such a relocation exercise on a long-distance commuter basis or as an unaccompanied move becomes less feasible.Family separation for extended periods causes stress and damages relationships. Thus, family members have to decide whether to accompany the relocated employee. If they decide not to do so, the transfer/assignment will most likely be turned down.If an organisation has identified the most appropriate person for relocation, to lose that talented individual from the new role is far from ideal. If, on the other hand, the family decides to move with the employee but is unhappy, this will strain family relationships and affect the work quality and productivity of the relocated employee. This will lead to poor return on investment from the organisational talent management strategy. Research shows that one of the major causes of international assignment failure concerns family members being unable to settle in, and cope with, their new host-country environment.Spouses/partners who are unable to gain employment and build their own social and friendship ties become isolated and unhappy. Children unable to settle in at school can become withdrawn and lonely. Unhappy families create unhappy homes.As explained in Relocate’s series of factsheets on family and employee support, organisations can develop and implement mobility strategies, policies and practices that support families on relocation.Interventions that are particularly valuable include Championing dual careers: promoting successful assignments, educational support and advice, and support for well-being and work-life balance. Those spouses and partners who pursue their own careers are likely to want to continue to do so. They are also likely to need to earn income to maintain their family’s standard of living and preserve their own financial independence.Finding suitable employment in the new location can prove difficult, especially if the relocation exercise involves international mobility. Organisations can support working spouses and partners in identifying potential employment opportunities by linking them with local employers and networking groups.If the relocation requires the spouse/partner to secure a visa or a work permit prior to gaining employment, advice on, and support with, obtaining the necessary documentation can be included in policy and be provided.Depending on the career of the spouse/partner and the opportunities available within the relocated employee’s own organisation, direct employment may be a possibility, or work could be offered on a contract basis.If it is not possible for the spouse/partner to work in paid employment, information on voluntary work opportunities can be provided. This helps spouses or partners to develop their own sense of place in the local community and undertake activities that boost their feelings of contribution and self-worth.International mobility presents cultural challenges, as explained in Relocate’s factsheet series on managing across cultures. Mobility policy that includes spouse/partner support with writing CVs/ résumés and interview training, cross-culturally tailored to the host location, will prove very valuable in securing employment opportunities.Challenges for relocated working family members can also include language and qualification differences. Language training and support to fund the updating of qualifications can go some way to help spouses/partners in such situations. Relocation policy may also include the provision of payments towards further education and/or personal endeavours (such as setting up a business). For spouses and partners who find themselves unable to follow their chosen careers – because there are no opportunities in the host location, for example – career counselling can prove immensely valuable. This enables individuals to take stock of their capabilities and experiences, and to think through future potential career options. One of the primary concerns of families on the move is the education of their children. Everyone wants the best opportunities for their youngsters, and families will be especially keen to secure a place at the best-possible school. Assessing global education systemsRelocation exercises are typically implemented quite speedily once the individuals are identified for the move. Families will have a myriad of issues to deal with. Global mobility professionals are also very stretched, and are unlikely to have the time or the expertise to advise on schooling.Given the time it takes to identify suitable schools and gain places, the in-depth knowledge and support provided by an education consultancy are invaluable. Problems that can arise include relocating partway through a school year. This is of particular concern given that classes are likely to be full. Children with special needs will require specific factors to be addressed. Educational consultancies typically specialise in providing such support.Pre-move reconnaissance visits can be used to visit potential schools and assess their ethos and culture, to establish suitability for children’s needs.Families with teenage children may require advice on higher-education opportunities, especially if they are being relocated abroad and wish to attend a university in the destination location or another country. Advice on how to navigate university admissions systems and open days will be very helpful to parents and teenagers. Relocation is an extremely busy time for families, but once the move is completed, a sensible work-life balance is required and must be maintained for employees. Family well-being must also be supported.Health, security and safety issues need to be addressed via organisational policy, especially in respect of international moves to less-developed countries.Work-life balance is well known to be challenging for expatriates. Workloads are generally high, and expatriates are expected to perform to an exceptional standard to generate a good return on the investment made in their terms and conditions and in supporting their families abroad.Expatriates have to cope with operating within different organisational and societal cultures. 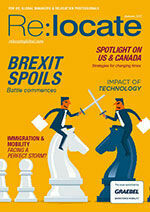 As Relocate’s factsheet series on managing across cultures explains, this can lead to reduced motivation, engagement and productivity if assignees lack cultural awareness.Poor, or lack of, communication with local people can result in assignees’ spending even more time trying to get work completed effectively. This can lead to serious work-life balance issues, with work overload spilling over into family life and damaging family relationships.Even if organisations have invested in family support to enable families to relocate (for instance, by helping with family employment and educational issues), if family time is ruined by work overload and highly stressed employees, the benefits will soon unravel. The consequent family discord will result in damage to employee productivity and potentially a failed assignment.To aid employees’ working relationships with local people and improve their work-life balance, cultural training helps to provide appropriate understanding of how best to manage and/or work with locals to gain the most productive outcomes. With regard to family well-being, health, security and happiness are crucial. Typically, organisational policy addresses healthcare insurances. Research has shown, though, that families are more concerned about access to quality hospitals and clinics and doctors who speak their language should an emergency occur in the host location.This is of major concern when the family is relocated to a developing country and/or a remote location. Support should therefore address such issues.Hence, in international relocation situations, organisational policy should make provision for appropriate healthcare access, security arrangements, and emergency evacuation procedures as necessary. Policy may also include provision for maternity arrangements for female assignees and spouses/partners. Although relocation policy typically no longer addresses pet relocation owing to cost-cutting measures, nonetheless pets are part of the family. The inability to relocate a pet can result in refusal to relocate. Organisations can address this by maintaining lists of contacts that can provide advice on pet shipment abroad, including necessary paperwork and other actions required.Miscellaneous expenses payments included in policy may be used by families to pay pet shipment costs. Mobility professionals can support this element of family relocation through good communications, highlighting the policy aspects which families can draw upon as necessary to meet miscellaneous costs.As our factsheet series shows, dual careers, education, well-being and cultural differences all impact on family mobility. Paying attention to the family and supporting mobility through practical interventions can make a significance difference to relocation acceptance and return on investment. For related news and features, visit our Partner & Family Support section.Access hundreds of global services and suppliers in our Online Directory Get access to our free Global Mobility Toolkit © 2017. This article first appeared in the Autumn 2017 edition of Relocate magazine, published by Profile Locations, Spray Hill, Hastings Road, Lamberhurst, Kent TN3 8JB. All rights reserved. This publication (or any part thereof) may not be reproduced in any form without the prior written permission of Profile Locations. Profile Locations accepts no liability for the accuracy of the contents or any opinions expressed herein.